thekillerrobots | The Killer Robots! If you’re in Fort Lauderdale Saturday, July 14th, be sure to stop by ArtServe’s RedEye event for some music, art and Killer Robots! We’ll be there meeting, greeting and taking pictures. It’s sure to be a fun evening! 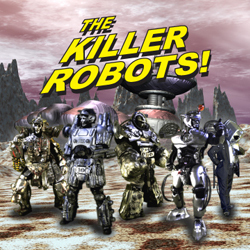 If you have Amazon Prime be sure to check out The Killer Robots! Crash and Burn! It’s the finale to episode 2 of I Am Robot You Are Not! Ruk, Lyta and Manu meet some killer robots and have a big rumble in the desert! 0 More Animated Robot Action! It’s a new cartoon from The Killer Robots! Episode 2.2 of I Am Robot You Are Not debuts today. Ruk, Lyta and Manu visit the Magog of the Wastelands in hopes of enlisting his help in defeating the marauding hordes of Bulgarr the Despicable. Check out more episodes at https://iamrobotyouarenot.com/episodes/. 0 I Am Robot You Are Not! Killer Robots Animated! The Killer Robots have caught up with some old and new friends to create a new animated series on YouTube. It’ll be coming out in pieces over the next year. Check it out!